There are many war memorials in Clermont L’Herault, which is twinned with Patchway. The memorial garden is located in the centre of the town opposite the old railway station, which until its closure would be passed by passengers at the beginning and end of their journeys. There are three memorials in the garden. 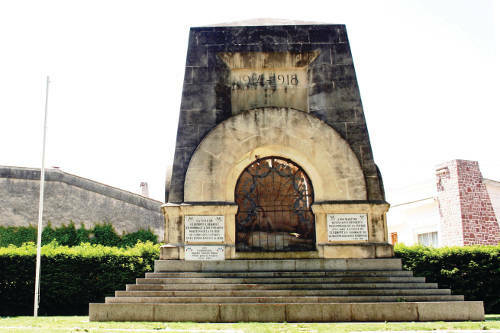 The largest, a cenotaph was designed by the pacifist sculptor Paul Dardé who lost a son in the First World War. It depicts a dead soldier watched over by a smiling half naked female cabaret dancer and is thought to illustrate Dardé’s revulsion of war. There are plaques dedicated to those who died in the First and Second World Wars and more recent in conflicts in Indo China and North Africa. 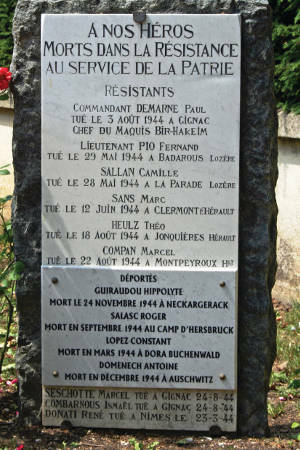 A plaque on a simple stone with names of civilians who fought and died.